This author has written previous articles for PA Times Online addressing cyberspace and the need for performance-based cyberspace organizations that use performance data to improve operations, all intended to optimize value to the American public. One key element of that is to manage towards specific measurable goals derived from a defined mission statement. While many federal agencies have developed a results-based performance management culture, the notion of results-based cyber performance continues to remain largely undefined. USCYBERCOM plans, coordinates, integrates, synchronizes and conducts activities to: direct the operations and defense of specified Department of Defense information networks and; prepare to, and when directed, conduct full spectrum military cyberspace operations in order to enable actions in all domains, ensure US/Allied freedom of action in cyberspace and deny the same to our adversaries. The GPRA Modernization Act of 2010 specifies that public-sector organizations develop a strategic plan that links the organization’s mission to strategic goals / objectives that are outcome-based evidence of demonstrated results. Cyber organizations often do not do that. Cyber organizations frequently fall back on more traditional performance measures based on information technology services which may not address strategic-level organizational issues. While their intent may be to implement a performance plan that focuses on organizational efficiency, effectiveness, and accountability, cyberspace organizations need a cyber performance management approach that includes mission statements written with a broad, strategic-level focus on the organization. From that “well-written” mission statement, strategic goals should be derived that clearly shows responsibility for cyber to the entire organization, strategic objectives should be measureable and contain outcome-based cyber performance metrics, and strategic initiatives should link to outcome-based results. The all starts with a mission statement. Mission statements should give the purpose of the organization and states its reason for existence. A mission statement is often derived from mandates and includes the larger social or political needs that the organization seeks to fill. Nowhere is this more critical than with cyberspace organizations. One technique this author has found useful for teaching the development of mission statements is described below. Senior leadership of cyberspace organizations could benefit from this technique which was adapted from a graphic originally developed in the US Army CIO’s Office. 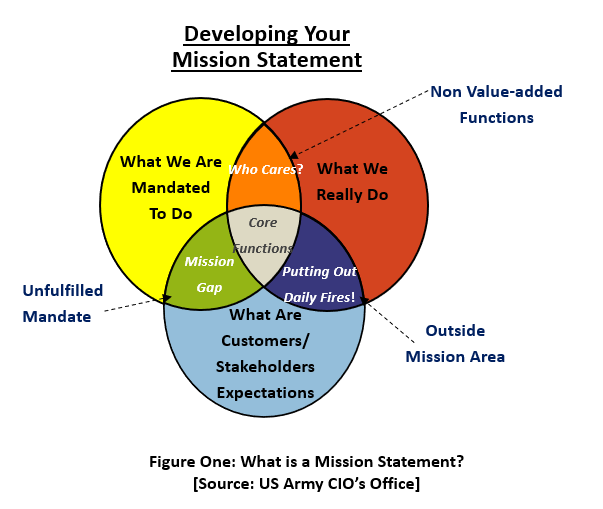 The real “mission” of an organization is found at the center of the graphic, at the intersection of all three areas; this is the area where senior leadership can say “We are mandated by law to do this, and it’s expected of us by our customers and stakeholders and we are doing it.” That is really the baseline function. That is really the mission of the organization. In the case of public sector cyber space organizations, this would mean to seek innovative approaches to improve cyber capability against growing threats and avoiding performance metrics used to demonstrate progress that are narrowly focused and fail to capture the progress made to improve cybersecurity.